Baker, Kage. 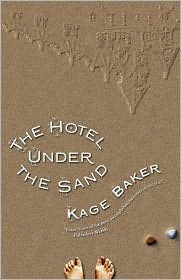 The Hotel Under the Sand. Tachyon Publications, 2009. Nine-year-old Emma is blown by a storm (of an uncertain nature) to a legendary island, where she meets a young ghost named Winston. No sooner has Winston told Emma of his job as Bell Captain at the most amazing hotel ever built and of the hotel's tragic burial, just before its opening day, under the sand during a huge storm more than 100 years ago (which brought about Winston's death as well), than another storm blows away all the sand and reveals the Grand Wenlocke in all its glory. The Grand Wenlocke was built by a most unusual and enterprising gentleman, and its most amazing innovation is a device that allows time in and around the hotel to stand still, so that its guests can take as long a vacation as they want and no time will have passed in the outside world. This magical technology means that the hotel, and its sole occupant, the cook Mrs. Beet, are entirely preserved in pristine condition. Emma, Winston, and Mrs. Beet are eventually joined by a pirate and the last remaining scion of the Wenlocke family - together they open the hotel to a throng of highly unusual and magical guests. The calm and even tone of the narration makes this story feel timeless - although the reader knows that Emma is a fairly modern girl and that Winston lived in the time of telegraphs and cinematographs and phonograph cylinders, the weird and magical isolation of the hotel really does manage to make one's era feel meaningless. This gives the book an old-fashioned feeling with a slightly quirky edge to it. There isn't much plot, most of the story centering around discovering the wonders of the hotel, finding its treasure (a fun sort of quest in itself), and getting it up and running. Although we hear a bit about the prior lives of most characters, Emma remains an enigma. We know only that she is the sole survivor of a terrible storm that wiped away everyone and everything in her life forever, and while she isn't one to mope, this gives the girl a tinge of sadness that only shows up sometimes. It's also a bit distancing - we don't get to know Emma well, and the other characters are quaint and even appealing but not quite real. What I found most appealing was the idea of a place quite separate from the rest of the world. Like the Titanic, it is perfectly preserved in a grand moment of time, and everything connected with it is exotic and otherworldly. Who wouldn't want to escape and spend some time in an elegant hotel on a tropical beach, where the food is first-rate and all eccentricities are looked upon benignly? And of course you can stay as long as you want, because time stands still in the hotel. I can only imagine that this idea would be almost as enticing to a young reader as it is to me. More troubling, there is one of those time-related conundrums that I can't seem to wrap my head around. The big gimmick of the Grand Wenlocke is that you can stay as long as you want "but when you left, only a weekend would have passed in the outside world," as Winston explains to Emma. So then - how could the Grand Wenlocke, not to mention Mrs. Beet, be perfectly preserved after 100 years have gone by in the outside world? I would think that if time had slowed down in the hotel, thousands of years might have gone by in there. I suppose we're supposed to assume that time is actually non-existent in the Grand Wenlocke or exists on a whole different plane. Still, it doesn't feel logical. But maybe my brain is just too noodley to understand space/time continuum-type concepts. This fantasy will not appeal to kids who want lots of action or even lots of magic; give it to kids who enjoy the gently humorous fantasies of Eva Ibbotson. I think it would also make a rather unorthodox but strangely compelling read-aloud. Recommended for contemplative kids ages 8 to 11. I just read this book, and I agree with you--it doesn't always work, but the parts that do are really appealing.